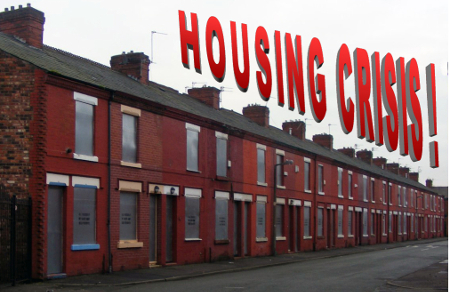 The housing crisis is nothing new, there has been an awareness of the growing problem ever since the Right to Buy policy was introduced in 1980 by the Thatcher led Tory government. The policy gave 5 million council house tenants the right to buy their home from the local council at discount prices, due to the lack of new council houses being built this led to a severe depletion in council housing stock. The decrease in housing stock was exacerbated by the fall in council house building, by local authorities, to insignificant levels by 1996. 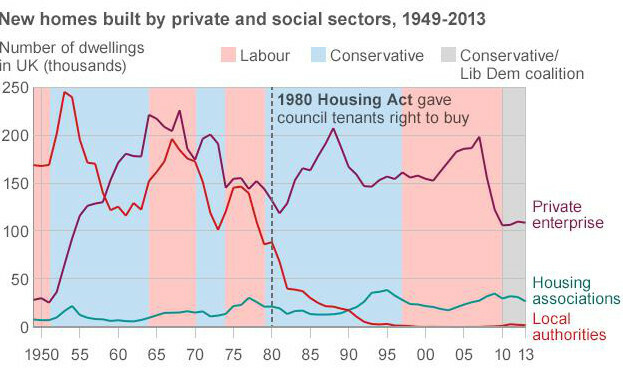 The graph below also illustrates that the loss of a large proportion of new build houses that were council houses pre 1980 has not been filled by the efforts of Housing Associations and private enterprise. In an attempt to increase the amount of affordable housing the Town and Country Planning Act 1990 (section 106) was introduced. This required a new housing development, of over 15 dwellings, to provide a set proportion of affordable housing, that proportion being 20% in Manchester. The Community Infrastructure Levy (CIL), a fixed rate tax on new developments, was also introduced in 2010 with the intention of it funding infrastructure projects to support the local area. In 2013, Financial Viability Assessments (FVA) was introduced to the Section 106 affordable housing requirements. This meant that property developers could appeal against their obligations to provide affordable housing if they could show, by a viability appraisal, that doing so would reduce their profit margin too much, making the development non-viable. The problem with these viability appraisals is that they are presented by expensive property consultancies in a complex and impenetrable manner. ‘Councils just don’t have the expertise to challenge viability reports… We can’t argue back’, a senior planning officer was reported to say in the Guardian. A major problem with FVAs is their lack of transparency as they are not subject to scrutiny. In a freedom of information request to Manchester City Council, it was revealed that MCCs financial viability assessment plan is not available to: the public, local councillors, local authority planning committee’s or local authority scrutiny committees. MCC also admitted that they did not get independent validation of FVAs using the Government District Valuer Service. The Salford Star reported how in twelve months developers managed to dodge planning fees of over £19 million and avoided paying for over 800 affordable homes by submitting FVAs that showed they would not make sufficient profit. Yet those same property developers were still making up to £24 million in profit on each contract. The Devo Manc deal incorporates a £300 million housing fund, to build 10,000 – 15,000 homes over ten years, that is under the control of the newly appointed interim Greater Manchester (GM) Mayor Tony Lloyd. You may have hoped that this fund would be used to address the severe shortage of affordable housing; sadly that is not the case. Another report from the Salford Star showed that £42.6 million of the GM housing fund has already been loaned to property developers to build on sites including Trinity Way in Salford and the contentious Pomona site in Trafford. Salford City Council failed to collect £1.28 million CIL for the Trinity way site, and lost the opportunity to build 76 affordable homes due to the developers FVA. Gerald Kaufman pointed out at a recent public meeting on Devo Manc that £300 million was just ‘a drop in the ocean’ towards Greater Manchester’s housing needs, and that over ten years it amounts to only £3 million per borough per year. The shortage of housing is one of the major factors resulting in the rocketing price of housing. After the economic crash in 2007/8 the housing market was the first thing to recover as the rest of the economy struggled; despite the fact that an inflated housing market in the USA was one of the major factors in precipitating the economic crash. In July 2015 the Office for National Statistics stated the average price of a house in the UK was £282,000. The average wage in the UK is £24,648 gross, which only enables that person to take out a mortgage on a house worth £110,000. In the Guardian, Owen Jones pointed out the hypocrisy of a Tory party calling itself the party of home ownership. ‘There are almost 250,000 fewer English and Welsh homeowners since David Cameron became prime minister. Even more staggeringly, the number of homeowners aged below 34 has plummeted by 50%’. He went on to describe how home ownership had dropped to its lowest level in three decades, and how the Tory ‘Help to Buy‘ scheme was inflating house prices. An inevitable outcome of the factors mentioned is that the private rented sector is booming, where people pay substantially higher rents for lower quality accommodation when compared to social housing. Private landlords now own one in five homes, and 4 out of 10 council houses sold with the Right to Buy scheme are also owned by private landlords. Private renters also have to deal with the insecurity of short term contracts and the ill health that often accompanies poor housing conditions. In 2010 the Building Research Establishment estimated it costs the NHS £600 million a year to deal with ill health caused by poor housing, another avoidable burden on our overstretched health system. Generation Rent is an organisation fighting for change in the private rented sector. Their website states that private renting has doubled in the last decade, and that around a third of renters have had to cut back on food and heating. They campaign for improvements in: affordability, professional management (i.e. a national register of landlords), security of tenure and living conditions; and encourage people to lobby their local MP to improve private renting. 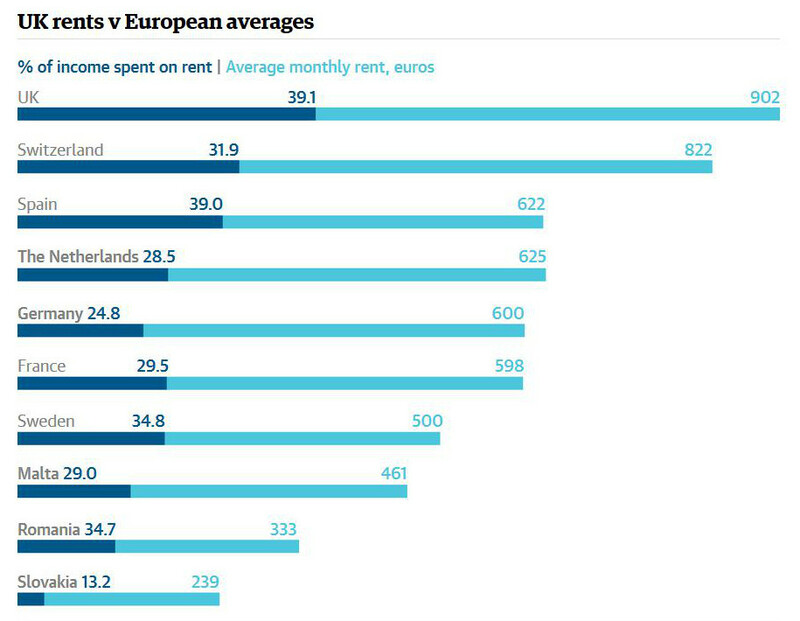 Tenants in the UK not only pay the highest average rents in Europe, they also pay the largest percentage of their income to pay the rent (see graph above). Along with house prices, rents have also risen. Between 2008-09 and 2012-13 average weekly rents increased in the private rented sector by 7% from £153 to £163, according to the English Housing Survey. The problem of the 7% rise in rents is compounded by the drop in real wages. The International Labour Organisation reported in 2013 that the average real wage in the UK had fallen by 7.1%, relative to the average wage in 2007. Insecure short term private rental contracts and shortage of social housing combined with cuts to social security and housing benefits, has seen a steady rise in homelessness in Greater Manchester and across the UK. According to government figures, in the first quarter of 2014 the number of households accepted as statutorily homeless was 12,540; this had risen to 13,650 by the last quarter, a rise of 8.9 %. The number of English households in temporary accommodation rose from 58,440 to 61,970 between 31st March and 31st December 2014, a rise of 6%. Manchester City Councils annual count of rough sleepers in Manchester on one night last November came to 43, it was 7 in 2010; local charities estimate that the real number is double that of the annual official count. Homelessness can only get worse with the cuts, £46 billion over 5 years, to social security announced by George Osborne. The removal of housing benefit entitlement from 18 to 21 year olds threatens a group who are already suffering rates of unemployment 3 times that of the general population. According to information published by Shelter the removal of housing benefit from 18 to 21 year olds will affect 19,894 people in the UK. Not all of these will have the option of living with family members as 62% of young people become homeless because friends and relatives will no longer accommodate them, often due to relationship breakdown. Housing benefit also pays for temporary and emergency accommodations such as hostels and domestic violence refuges. Cutting this benefit can only result in more young people, our future, sleeping rough. A report by Crisis called ‘At what cost’ provides a compelling argument of the economic folly that allowing homelessness to persist and rise engenders. It estimates the cost to the taxpayer, over a year, of preventing a person becoming homeless or letting that person become homeless. In the examples presented (based on real costs and experiences of the homeless) it estimates the extra cost to the taxpayer of not preventing homelessness ranges between £3,000 and £19,000 per person. Although the Tories are primarily to blame for this crisis, the previous Labour government and current Labour councils have done nothing to address the problem. Our political system has become so short sighted that it struggles to see beyond its own nose. Having only knee jerk reactions to whatever the mainstream media deems an important issue at the time, resulting in incoherent, disjointed and more importantly ineffective strategies to deal with problems like housing. When does a crisis become a disaster? The answer is it already has, for the ever increasing number of homeless people on our streets; every day there are more living on the brink of disaster due to the austerity measures pursued by this government. The Tory agenda is to provide more security for those who already have it and less security for those who most need it, a cynical ploy to secure support amongst their voters. Everyone needs to stand up, be counted and become active if we are to oppose these Tory designs to take our society back to the Dark Ages. This entry was posted in Homeless, Manchester, Manchester Mule, Politics, Publications and tagged Austerity, Devo Manc, homeless, Manchester, NHS, Salford by Conrad Bower. Bookmark the permalink.